All transactions are safe and secure with a reliable history in online purchasing behind each of our associates. 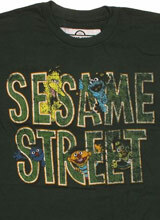 Buy the Sesame Street Vintage Name t-shirt to own Sesame Street clothing and merchandise. These adorable black Sesame Street t-shirts are a basic and stylish way to celebrate your favorite childhood characters, including Grover, Elmo, Cookie Monster and The Count. They are in good spirits as they stroll down the street. These characters' smiles will lighten up anyone's mood, as they will remind both younger and older fans of sunny days. So if you are looking for a stylish design that features the cast, snag this fitting Sesame Street tee today and give a little spin for everyone to see. It's friendlier than a "trashy" Oscar Grouch shirt. In addition to the Sesame Street Vintage Name tee above, browse the Sesame Street Clothing Gallery for more apparel like men's and women's clothes, kids shirts or hoodies.